A solar research facility associated with the California State University, Northridge (CSUN). San Fernando Observatory A solar research facility associated with the California State University, Northridge (CSUN). 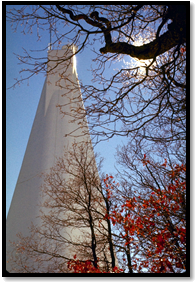 The Richard B. Dunn Solar Telecope specializes in solar high resolution imaging and spectroscopy. These observations allow solar astronomers worldwide to obtain a better understanding of the sun. Dunn Solar Telescope The Richard B. Dunn Solar Telecope specializes in solar high resolution imaging and spectroscopy. These observations allow solar astronomers worldwide to obtain a better understanding of the sun. 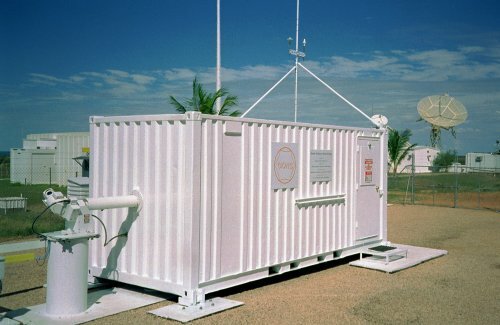 The Global Oscillation Network Group (GONG) studies the internal structure and dynamics of the Sun by means of helioseismology - the measurement of acoustic waves that penetrate throughout the solar interior - using a six-station, world-circling network that provides nearly continuous observations of the Sun's 'five-minute oscillations'. GONG The Global Oscillation Network Group (GONG) studies the internal structure and dynamics of the Sun by means of helioseismology - the measurement of acoustic waves that penetrate throughout the solar interior - using a six-station, world-circling network that provides nearly continuous observations of the Sun's 'five-minute oscillations'. 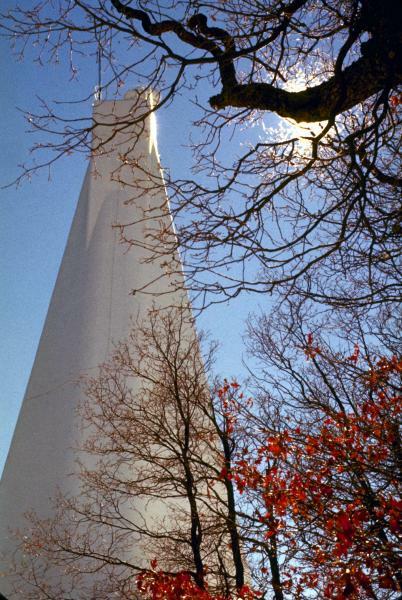 The John W. Evans Solar Facility consists of two main telescopes: a 16" coronagraph and a 12" coelostat telescope. Each of these telescopes can be used to feed one of several instruments. This means that two observing programs can be run simultaneously. The Evans Facility is used to conduct observations of the sun for both local staff and visiting scientists worldwide. Observations are made of the solar corona, and also of transient phenomena such as flares, eruptive prominences, and surges, as well as quiet sun features. Evans Solar Facility The John W. Evans Solar Facility consists of two main telescopes: a 16" coronagraph and a 12" coelostat telescope. Each of these telescopes can be used to feed one of several instruments. This means that two observing programs can be run simultaneously. The Evans Facility is used to conduct observations of the sun for both local staff and visiting scientists worldwide. Observations are made of the solar corona, and also of transient phenomena such as flares, eruptive prominences, and surges, as well as quiet sun features. The Hilltop Dome Facility houses an octagonal spar. Like the spar in the Evan's Facility, the Hilltop spar has its own guider system to keep its several telescopes centered on the sun. It also acts as an eight sided optical bench on which to mount instruments. Some of these are patrol cameras, while others are test instruments. The spar allows several instruments to be operated simultaneously. The patrol cameras can then operate automatically. Hilltop Dome Facility The Hilltop Dome Facility houses an octagonal spar. Like the spar in the Evan's Facility, the Hilltop spar has its own guider system to keep its several telescopes centered on the sun. It also acts as an eight sided optical bench on which to mount instruments. Some of these are patrol cameras, while others are test instruments. The spar allows several instruments to be operated simultaneously. The patrol cameras can then operate automatically. (SOLIS) is a new synoptic facility for solar observations over a long time frame that is funded by the National Science Foundation (NSF) and designed and built by the National Solar Observatory (NSO). SOLIS will provide unique observations of the Sun on a continuing basis for several decades using state-of-the-art techniques. These long-term studies of the astronomical object most important to humanity will provide fundamental data to understand the solar activity cycle, sudden energy releases in the solar atmosphere, and solar irradiance changes and their relationship to global change. SOLIS (SOLIS) is a new synoptic facility for solar observations over a long time frame that is funded by the National Science Foundation (NSF) and designed and built by the National Solar Observatory (NSO). SOLIS will provide unique observations of the Sun on a continuing basis for several decades using state-of-the-art techniques. These long-term studies of the astronomical object most important to humanity will provide fundamental data to understand the solar activity cycle, sudden energy releases in the solar atmosphere, and solar irradiance changes and their relationship to global change. (NoRH) is a radio telescope dedicated to observe the Sun. "Helio" means the Sun, "graph" means an imaging telescope. It consists of 84 parabolic antennas with 80 cm diameter, sitting on lines of 490 m long in the east/west and of 220 m long in the north/south. Its construction took 2 years and cost 1.8 billion yen. The first observation was in April, 1992 and the daily 8-hours observation has been done since June, 1992. Frequency 17GHz (Right and left circular polarization), 34GHz (only intensity) Field of view Solar full disk Spatial resolution 10 arcsec (17GHz), 5 arcsec (34GHz) Temporal resolution 0.1 sec (Event), 1 sec (Steady) As the NoRH is a radio interferometer, original data are sets of correlation values of all the combination of antennas. They correspond to the spatial Fourier components of the brightness distribution of the solar disk. In most cases, it is necessary to synthesize images from the original raw data. To maximize the data use, we prepare images, indices and other related materials routinely and put them on our Web page. This Web page is to help the scientists in the world to look for interesting phenomena detected by the NoRH and to start the actual analysis using the original data set. Software for image synthesis and analyses are prepared. Image synthesis and analyses can be done remotely through the Internet. This data and images can also be used for science education. We are glad if our images are of any help in education at schools, universities, and public. 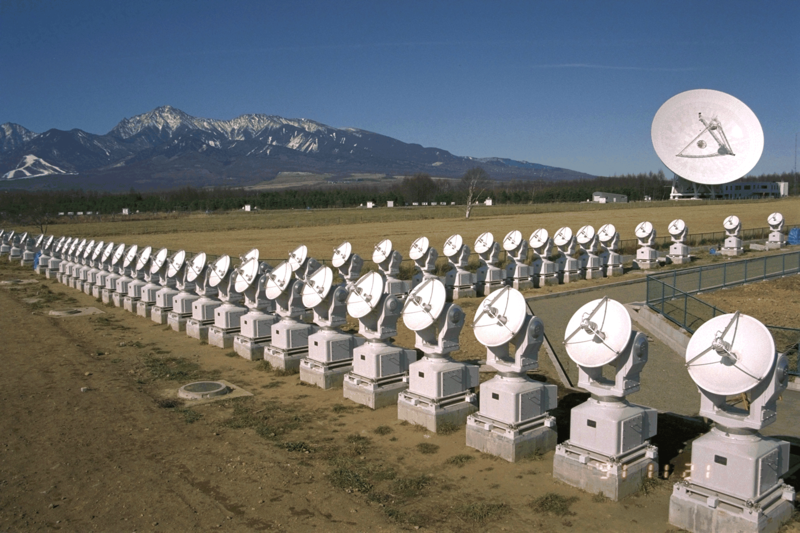 Nobeyama Radioheliograph (NoRH) is a radio telescope dedicated to observe the Sun. "Helio" means the Sun, "graph" means an imaging telescope. It consists of 84 parabolic antennas with 80 cm diameter, sitting on lines of 490 m long in the east/west and of 220 m long in the north/south. Its construction took 2 years and cost 1.8 billion yen. The first observation was in April, 1992 and the daily 8-hours observation has been done since June, 1992. Frequency 17GHz (Right and left circular polarization), 34GHz (only intensity) Field of view Solar full disk Spatial resolution 10 arcsec (17GHz), 5 arcsec (34GHz) Temporal resolution 0.1 sec (Event), 1 sec (Steady) As the NoRH is a radio interferometer, original data are sets of correlation values of all the combination of antennas. They correspond to the spatial Fourier components of the brightness distribution of the solar disk. In most cases, it is necessary to synthesize images from the original raw data. To maximize the data use, we prepare images, indices and other related materials routinely and put them on our Web page. This Web page is to help the scientists in the world to look for interesting phenomena detected by the NoRH and to start the actual analysis using the original data set. Software for image synthesis and analyses are prepared. Image synthesis and analyses can be done remotely through the Internet. This data and images can also be used for science education. We are glad if our images are of any help in education at schools, universities, and public. The SST is operated by the Institute for Solar Physics of the Royal Swedish Academy of Sciences but located within the Observatorio del Roque de los Muchachos of the Instituto de Astrofíca de Canarias on the island of La Palma, Spain. The SST replaces a previous 50 cm telescope that has been a world leading solar research instrument for over ten years. The Swedish 1-m Solar Telescope The SST is operated by the Institute for Solar Physics of the Royal Swedish Academy of Sciences but located within the Observatorio del Roque de los Muchachos of the Instituto de Astrofíca de Canarias on the island of La Palma, Spain. The SST replaces a previous 50 cm telescope that has been a world leading solar research instrument for over ten years. The Vacuum-Tower-Telescope [VTT] is the main observing facility for the Kiepenheuer Institute. It's focal length is 46 m. The coelostat's mirror diameter is 80 cm [see title image]. With the primary mirror's aperture of 70 cm small scale structures down to a size of 150 km [0.2 arcsecs] may be observed at the solar surface. The VTT Building has a height of 38 m including the dome. KIS The Vacuum-Tower-Telescope [VTT] is the main observing facility for the Kiepenheuer Institute. It's focal length is 46 m. The coelostat's mirror diameter is 80 cm [see title image]. With the primary mirror's aperture of 70 cm small scale structures down to a size of 150 km [0.2 arcsecs] may be observed at the solar surface. The VTT Building has a height of 38 m including the dome. Just five years after George Ellery Hale founded the Mount Wilson Solar Observatory with a grant from the Carnegie Institution of Washington, designs for a long-focal-length tower telescope were completed. In 1908, Hale discovered magnetic fields in sunspots (using the 60-foot solar tower built in 1907) by applying the principle of Zeeman splitting, where a spectral line will usually be split up into several components in the presence of a magnetic field. This was a discovery of great import. In order to study the Zeeman splitting of sunspots more precisely, Hale needed a telescope with a larger image scale and a spectrograph with a greater linear dispersion than the 60-foot could provide. Because of this, funds were provided by the Carnegie Institution of Washington, and in 1909, the construction of the 150-foot solar tower was begun. Mt. 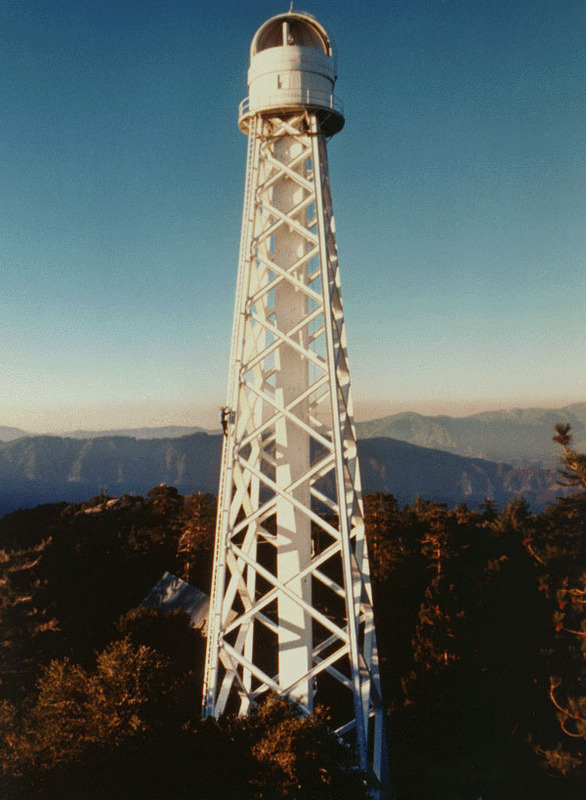 Wilson Just five years after George Ellery Hale founded the Mount Wilson Solar Observatory with a grant from the Carnegie Institution of Washington, designs for a long-focal-length tower telescope were completed. In 1908, Hale discovered magnetic fields in sunspots (using the 60-foot solar tower built in 1907) by applying the principle of Zeeman splitting, where a spectral line will usually be split up into several components in the presence of a magnetic field. This was a discovery of great import. In order to study the Zeeman splitting of sunspots more precisely, Hale needed a telescope with a larger image scale and a spectrograph with a greater linear dispersion than the 60-foot could provide. Because of this, funds were provided by the Carnegie Institution of Washington, and in 1909, the construction of the 150-foot solar tower was begun. 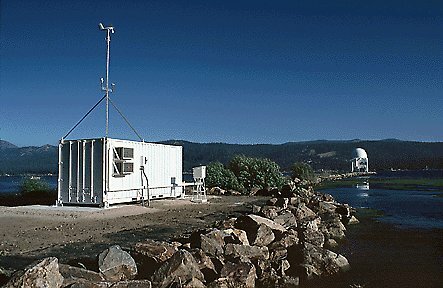 The Big Bear Solar Observatory (BBSO) exploits the excellent climatic conditions of Big Bear Lake to study the Sun, source of life on Earth. 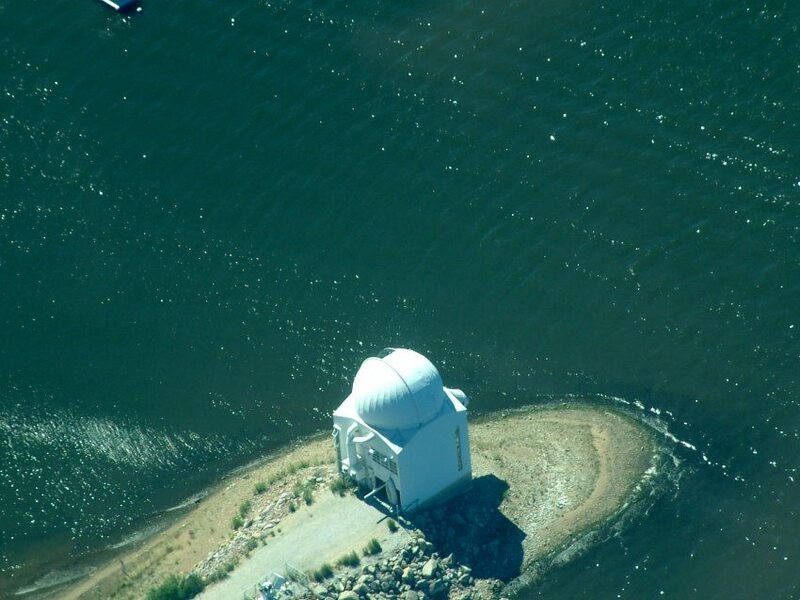 The observatory is located in the middle of Big Bear Lake to reduce the image distortion which usually occurs when the Sun heats the ground and produces convection in the air just above the ground. Turbulent motions in the air near the observatory are also reduced by the smooth flow of the wind across the lake instead of the turbulent flow that occurs over mountain peaks and forests. These conditions, combined with the usually cloudless skies over Big Bear Lake and the clarity of the air at 2,000 meters (6,750 feet) elevation, make the observatory a premier site for solar observations. 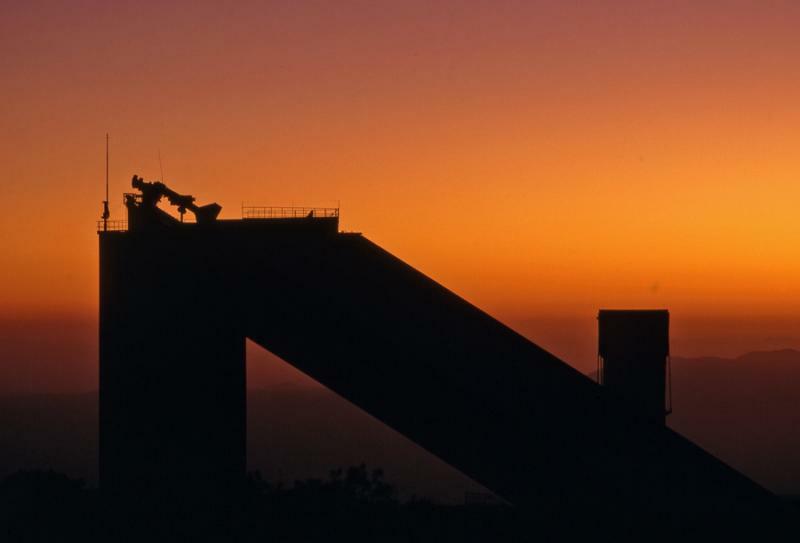 The observatory was built by the California Institute of Technology in 1969. Management of the observatory, and an array of solar radio telescopes at Owens Valley Radio Observatory (OVRO) in Owens Valley, California, was transferred to the New Jersey Institute of Technology on July 1, 1997. Funding for the operation of the observatory is from the National Aeronautics and Space Administration (NASA), the National Science Foundation (NSF), the United States Air Force, the United States Navy and other agencies. BBSO The Big Bear Solar Observatory (BBSO) exploits the excellent climatic conditions of Big Bear Lake to study the Sun, source of life on Earth. 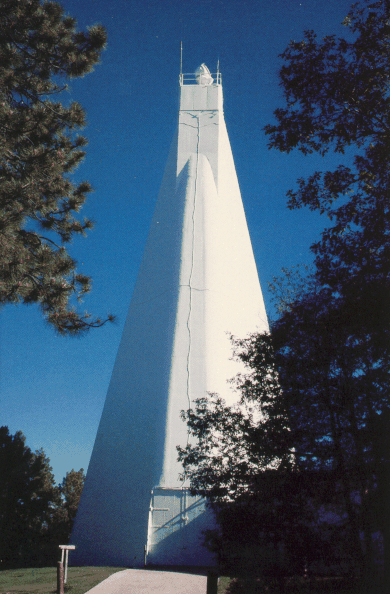 The observatory is located in the middle of Big Bear Lake to reduce the image distortion which usually occurs when the Sun heats the ground and produces convection in the air just above the ground. Turbulent motions in the air near the observatory are also reduced by the smooth flow of the wind across the lake instead of the turbulent flow that occurs over mountain peaks and forests. These conditions, combined with the usually cloudless skies over Big Bear Lake and the clarity of the air at 2,000 meters (6,750 feet) elevation, make the observatory a premier site for solar observations. The observatory was built by the California Institute of Technology in 1969. Management of the observatory, and an array of solar radio telescopes at Owens Valley Radio Observatory (OVRO) in Owens Valley, California, was transferred to the New Jersey Institute of Technology on July 1, 1997. Funding for the operation of the observatory is from the National Aeronautics and Space Administration (NASA), the National Science Foundation (NSF), the United States Air Force, the United States Navy and other agencies.